American’s Admirals Club has always offered free alcoholic beverages to members and guest of their international lounges, but now all their domestic clubs will also offer complimentary mixed drinks, beer and wine. As far as I know, that leaves only United’s Red Carpet Club still offering drinks for purchase. FORT WORTH, Texas, Sept. 21 /PRNewswire/ — This drink is on us! 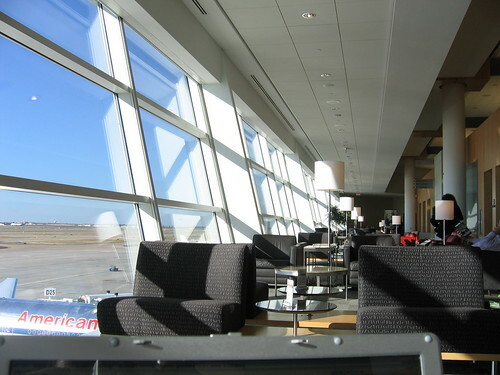 Beginning Oct. 1, American Airlines is offering travelers another benefit of membership in its Admirals Club® lounges. American will offer alcoholic beverages, including wine, beer and spirits, free of charge to customers visiting any of its domestic clubs, in addition to complimentary coffee, tea, soft drinks and juices. Domestic clubs will offer well brand liquors, as well as beers and house wines as a complimentary service on Oct. 1. Premium liquors and wines and a selection of Amora™ fresh food items will be available for purchase in all U.S. Admirals Club lounges. Menu items vary by location, and include fresh salads, sandwiches, hot entrees and small bites. Seasonal and regional specialties are featured throughout the year, with special chef demonstrations offered at select clubs. All menu items are available to enjoy in the club or for carry-out. Customers visiting an international Admirals Club location will continue to enjoy complimentary alcoholic and non-alcoholic beverages as they do today.